How can I help prevent stings from bees and other insects? The best way to help prevent stings is to establish proper ways to interact with insects. 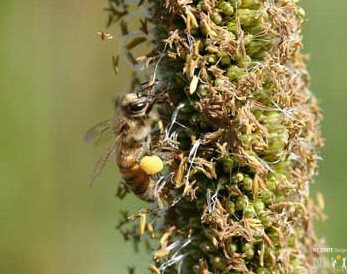 Bees are most likely to sting when they are near their hive and feel threatened. When bees are away from their hive gathering pollen and nectar they are very busy and not likely to sting unless they are bothered – inadvertently or deliberately. Be cautious and respectful of bees and other stinging insects. Remain calm and move slowly. Use care when entering sheds and other places where stinging insects may nest. Wear light-colored clothing and do not wear perfumes or scented soaps, deodorants, lotions, etc.